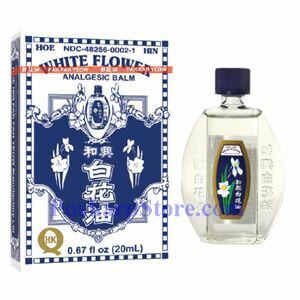 Hoe Hin White Flower Analgesic Balm, also called white flower oil, is a combination of essential oils derived from lavender, eucalyptus and peppermint, popularly used in the Far East as a natural herbal pain reliever. Just a few drops of oil transforms warm water into a soothing foot soak to relieve tired feet. The floral scent acts as aromatherapy to release stress, clear sinuses, and relax the entire body. The White Flower Analgesic Balm is conveniently portable to be used as a fragrance, quickly ease headaches, or used as a rub to relax muscle tension at any time.